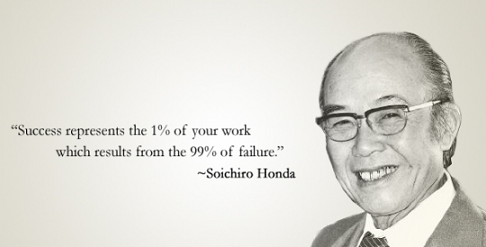 1946 marks the first year production of Honda motorcycles by Soichiro Honda. (picture provided by findlayhondaflahstaff.com) WWII had just ended previously in 1945 and a war-devastated Japan needed an answer to the high demand for cheap transportation. Soichiro spent the next three years designing and developing his engine for his bicycles. 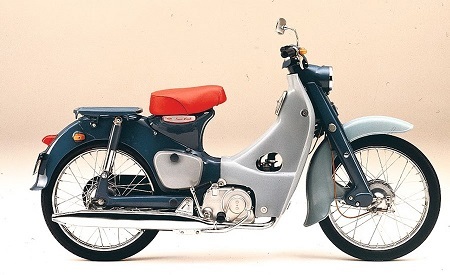 In 1949, Japan got it’s answer with the first Honda motorcycle called the Model D for Dream. As a kid, Soichiro was infused with mechanical skills he attained from working on mechanical devices given to him by his father. Gihei Honda was the town’s local blacksmith and Soichiro refined his mechanical skills over the years as he helped his dad, Gihei, fix and sell bicycles and motors. He became so proficient by the age of 17 that he was picked as the mechanic for Shinichi Sakibahara, a famous race car driver in Japan at that time. Soichiro eventually opened his repair shop four years after working for Shinichi, where he continued mastering his engineering and mechanical skills. In 1958, Soichiro disrupted the motorcycle market in the U.S by selling the first Honda, a C100 Super Club. What’s the bike’s claim to fame? It is widely recognized as the largest-selling motorcycle of all time with more than 60 million units to date and counting. The bike will happily give the rider an astounding 90 mpg along with a cheaper price tag than most current small motor bikes. Picture provided by Motorcyclenews.com. 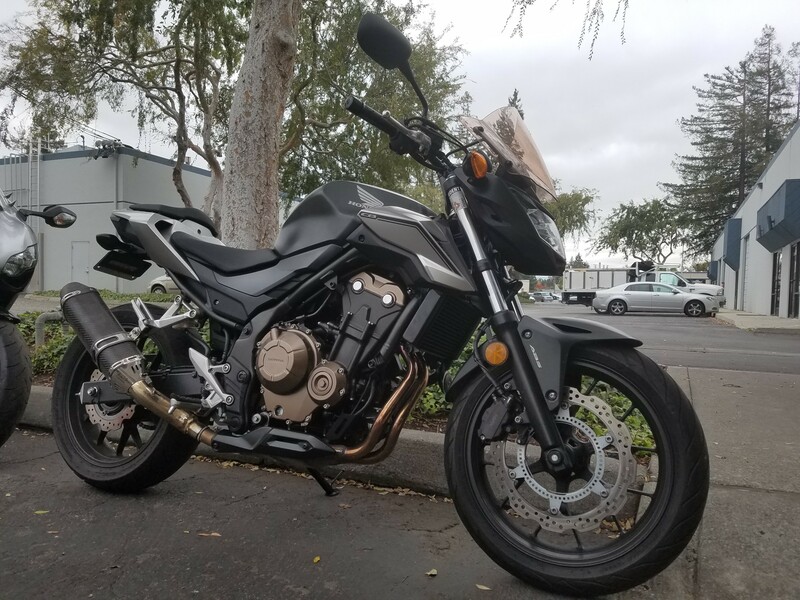 Since then, Honda has continued to build its reputation as being most “reliable” with its continued success over the years from their Honda CB 77 to the super hawk models and into the modern age of sportsbikes with the 87′ CBR600F and the street legal 92′ NR 750. In 2007, Honda also became the first manufacturer to feature air bag crash protection on a motorcycle. In addition to Honda’s motorcycle superb reliability, they have continued to manufacture motorcycles with consumer safety as it’s top priority. Apart from being the largest motorcycle manufacturer, they are the largest engine builder and 6th largest automobile producer in the world. 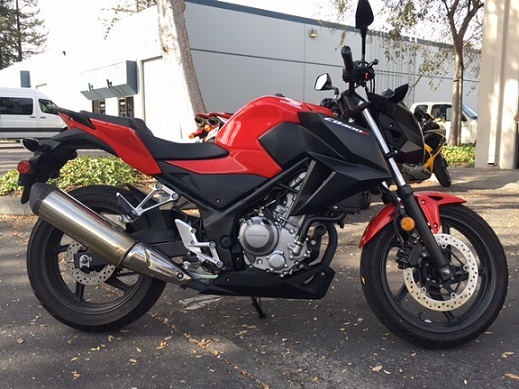 Check out our Honda Inventory for more details on any of Honda’s most dependable sportsbikes. The freeway can be an intimidating place for most beginner riders. Here at AK Motors, we highly value our customer’s safety; so we’ve put together a list of tips for safe riding on the freeway! On-ramps are highly dangerous where traffic is merging onto or off the highway. They often consist of sharp turns, forcing motorcyclists to lean hard to turn their motorcycle. Even more so, riders should be aware of the increased dangers on-ramps pose when they are wet or slippery. Successfully negotiating the curve of the on-ramp comes as the first challenge to any rider. As a rider, you must always monitor the traffic around you at all times. As you approach the freeway from the on-ramp, you must identify a safe spot that you can merge into and signal to accelerate (at a safe and controllable speed) into that spot safely, essentially merging with the freeway traffic. If you are already on the freeway and passing an on-ramp where traffic is getting onto the highway, move away to the far left lanes as possible. Most drivers will not see you (motorcycle) and mistake the space you occupy as free to merge into. One important thing to remember, riding on the far right lanes where you are passing on-ramps poses higher risks as many drivers make the last minute cross over lanes to exit. 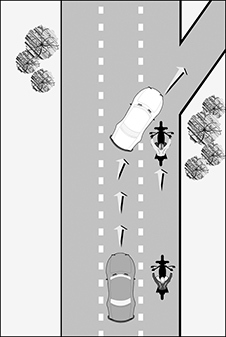 Below is an illustration showing a vehicle crossing a lane to exit at the last minute and what dangers are present for those riding in the far right lanes. Illustration by John L. Stein. Other tips include being aware of your lane positioning. Avoid riding in vehicles blind spots or right beside vehicles. Pressingly important, is your distance from other vehicles on the freeway. Always keep a safe distance between you and other vehicles, especially SUVs, trucks and semi trucks. The rule of thumb is the larger the vehicle, the larger the blind spot. Changing lanes requires extreme caution on the freeway. Before changing lanes, you need to ensure that there is enough space between you and the vehicles around you. Ensure that space you want to merge is clear and that no additional vehicles are trying to merge into the same space. Miscalculating the speed of the traffic, especially the speed of the vehicles behind you, can cause serious or fatal accidents. Showing your intention of merging into another lane on the freeway is recommended as the turn signals on motorcycles are small and hard to see. Holding your hand out to indicate left/right merging intentions helps other drivers see your position. Again, always monitor the traffic around you at all times! If you want more information, please check out the DMV website for motorcycle safety on the freeway. We, AK Motors, also recommend reading our other blogs on lane splitting safely and riding your motorcycle in the rain. 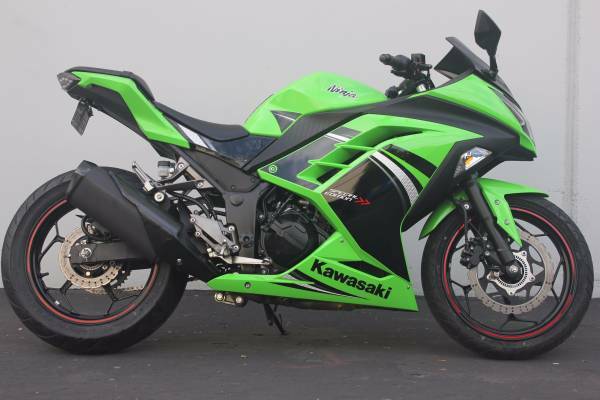 Check out our inventory for some of the hottest used bikes around town! Yamaha launched the YZF-R1 in 98′ to create a small engine by doing a “stacked gearbox” design which was considered revolutionary at the time. The R1 hardly needs an introduction, its dual front ram air intakes and under-tail dual exhaust are enough to make anyone aware that this machine means business. The YZF-R1 has a 7-level traction control system (MotoGP) that has been developed, so it’s rider may not feel the harsh/unnatural intervention from the system. Additionally, traction control reduces tire wear owing to less wheel spin. The bike is powered by a 998cc in-line four cylinder engine and has all the technological advances developed for the previous model. This beautiful piece of machinery features a Yamaha Chip Control Intake; this intake system widens the spread of power, and the fuel injection system provides maximum smooth throttle response. The bike has excellent cornering capability and crisp handling due in partly to the aluminum frame that offers exceptional rigidity balance. The sound that they YZF-r1 makes is dissimilar to any inline-four cylinder supersport. Sulthoni from Topspeed.com writes “Crossplane crankshaft technology proven in victory after victory on MotoGP® machines provides a high-tech uneven firing interval. Unlike typical inline-four engine design, where the two outer and two inner pistons move together in pairs with 180°intervals, the crossplane crankshaft has each connecting rod 90° with a unique firing order of 270° –180° – 90° – 180°. This overcomes the inherent fluctuations in inertial torque during each engine revolution, and the accompanying peaky torque characteristics. Instead, combustion torque continues to build, giving the rider more linear throttle response with awesome power and traction out of the corners. Seven-level Traction Control System allows the rider to get more traction and drive while exiting corners.” Furthermore, the engine elects a coupling-type balancer, which effectively spins in the opposite direction as opposed to the crankshafts; this maximizes power output as well as rider comfort. The first feature of the crossplane appeared in the 2009 YZF-R1 model, and it was claimed that the rider would experience two engines in one. Yamaha’s incorporation of the cross-plane crank design offers more low-end pull than traditional layouts and you can ride more confidently in tricky conditions with Yamaha’s simplistic, but effective traction control system. 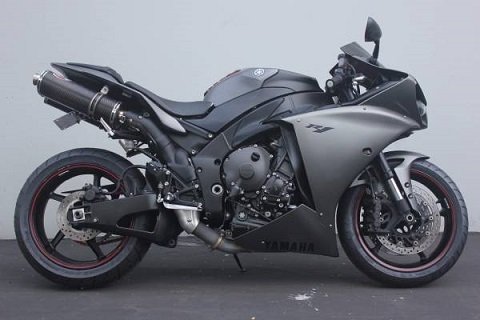 Below, we have a beautiful 2013 YZF-R1 for sale. Please click on the link for more information. Beginning in Morro Bay (San Luis Obispo County), the route one stretch runs along the California coast line for about an estimated 126 miles up to Monterrey Bay. This stretch of asphalt heaven has been named by the Department of Transportation as part of the national list of “All American Roads.” This list only has 19 highways and Route One is the only HWY representing California. Thus, is it a must see and ride hwy for anyone looking for a scenic route and a little adventure. 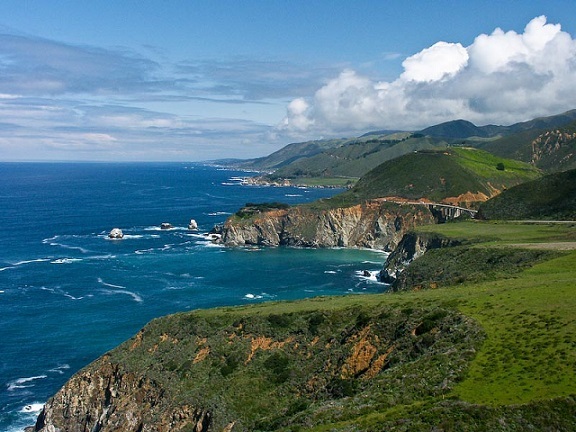 The coastal view is breathtaking with inland scenery featuring waterfalls, rolling hills, flowered meadows, rock outcroppings, redwood forests, coastal mountains and lush valleys. Much of the media over time has honored this classic American route in many books, articles, magazines, websites and movies. There are a number of lighthouses along the hwy with a generous amount of animal life including sharks, pelicans, bat rays, sea lions, etc. There are also a total of 7 state parks and range of historical interests along the hwy. Now, the only question is, what are you waiting for? 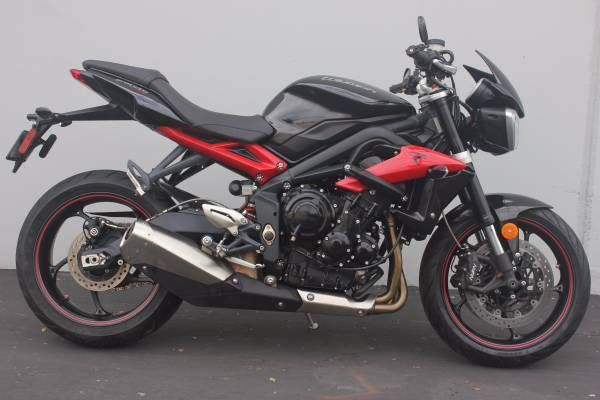 At AK MOTORS, we currently have the 2013 PCX 150, but the 2015 CB300F was just sold. Click on the highlighted links to check them out! With the continuous increase in gas prices from time to time, it’s no wonder Honda strongly holds their position as the World’s Best selling motorcycle company in the world. Back in 2008, gas prices were just at $1.84 (Average). Now days, we would be lucky enough if the gas prices even came close to $2.30. The national average for 2015 was $2.64, which is a total of $97 Billion in reduction from the previous year. Having fuel efficient transportation is highly important for consumers now more than ever. With that in mind, Honda has been improving their fuel efficient technology and applying it to every motorcycle/car they build. This is partly the cause for the rise in their automobile and motorcycle units sold. For 2015, they were able to make a profit of $410 million dollars through their motorcycle segment. That’s because their motorcycles/scooters have continued to be dubbed most reliable and most fuel efficient year after year. The Japanese company has managed forge and maintain their position among fellow Japanese competitors Kawasaki, Yamaha and Suzuki. Among the Japanese Big Four, Honda’s reputation as a reliable company/brand puts them ahead of the other three. You will find the internet echoing Honda’s reliable reputation through many outlets. First introduced in 98’/99′, the Yamaha R6 took the middleweight world by storm with its high-horsepower engine and aggressive handling. The Japanese inline-four was an instant hit, and 1999 was the year the R6 took the World Supersport crown. One of the first updates came in the year 2001 with a newer fork and fully-adjustable shock. Of course, there were some other minor changes and small updates. The major re-vamp of the R6 followed in 2003 with all new styling highlighted looks and internally receiving fuel injection to have a slightly longer stroke for a full 600cc. With the chassis, the update came an inverted fork, more aggressive steering geometry, and piggyback rear shock. 2006 saw another revision with the new (previous) 599cc engine for higher rpms. Today’s R Series are built with the highest power, lowest weight and unrivaled agility. Everything about the R6 is built towards ultimate cornering for the rider and the machine to work as a single unit in operation. Light on it’s tires but a killer ride for sure. 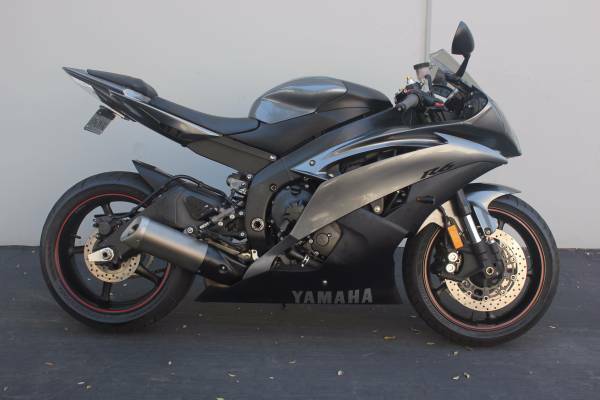 Also, check out our 2013 Yamaha R6 we have for sale!